As you head head south on Interstate 81 through Washington County in Southwestern Virginia, the very last winery before you leave the state is Abingdon Vineyard and Winery. There on a lovely wooded property, on the banks of the South Holston River, is where you’ll find the tasting room. Abingdon is in the midst of the Blue Ridge. The tallest mountains in the Appalachians are just across the border in North Carolina and Tennessee. Virginia’s tallest mountain is just a short drive away in the Mount Rogers National Recreation Area. The Virginia Creeper Trail, an old narrow-gauge rail bed repurposed as a bike trail through the mountains, is in the neighborhood. So this is more than just another rural winery, it’s in the midst of a major tourist destination. When Abingdon started planting vines in 1998, there were only thirty five wineries in Virginia and none in this corner of the state. They have twelve acres of fruit planted at about 1950 feet and in many ways the elevation is good for the grapes because it’s cooler, but this is still a pretty hot and humid region. As a result, Abingdon has a cool, but short, growing season. The grapes have to be harvested early to avoid the types of fungal maladies caused by damp air. This creates conditions that result in high acidity in the Abingdon wines. Nevertheless, the winemaking challenges can be overcome by a good winemaker. Abingdon produces 2000 cases each year and about two dozen different wines. I didn’t taste all of the offerings, but I was pretty impressed with the ones I did taste. Acidity is not necessarily a bad thing and is a component that allows a wine to pair well with food. There is something at Abingdon for every palate. I found many of the wines to be balanced and, while there are some sweet wines, most of the wines I tasted were dry or off dry. There were several wines of note, which is more than I typically mention and too many to talk about here. The Viognier was quite good, with a nice crisp acidity that is not often found elsewhere in the state. A semi-dry Riesling had three percent residual sugar, but that was balanced against the acidity to resemble a German Riesling. There are also a couple reds that I should mention. The Cabernet Franc spent twenty three months in oak. It was dry and did display that acidity I referred to, but it is an excellent food wine. Our Special Red is a blend of Cabernet Franc, Chambourcin and Cabernet Sauvignon that spent twenty one months in oak. It was dry, balanced and drinking well with characteristics of all three varietals. These wines can compete with any in the state. The tasting room has a very homey and had almost country feel. There is a fireplace in one corner, that must be very inviting in the cooler months. The grounds are wooded and offer ample seating with views of the river and the small stream that flows across the property. It’s a setting unlike any I’ve encountered at other Virginia wineries. I found it to be very peaceful and relaxing. So excellent wine and a beautiful setting sound like the ingredients for a nice visit. If you’re exploring Virginia wineries or just happen to be in the area, this one is just a short hop from I 81 and definitely worth checking out. It was early spring and one of those gorgeous days when the buds on the trees are just beginning to become leaves. The GPS reception was fading in and out as I drove through the remote northern corner of Floyd County, Virginia. I eventually located the entrance and drove down the lane and into the narrow valley toward AmRhein’s Wine Cellar. After parking, I took a few minutes to walk around the property and inspect the vineyards that are planted on the hillsides. There were tents set up on the property for, as I later found out, two separate events that were scheduled for that afternoon. The owners and other staff members were working a festival and there was a skeleton crew left behind to manage both the events and the tasting room. A few people were gathered for wine tasting, but it was early and things still pretty low key. Russel Amrhein started planting vines in 1995 and bottled his first vintage four years later. Today there are three separate vineyards and only estate fruit is used to make the 1500 cases that are produced annually. Along with the varietals typically grown in Virginia, there are a few surprises like Sauvignon Blanc and Aglianico. They are making a total of nineteen wines. I had an opportunity to taste eleven of those offerings. The tasting list was divided into whites, reds and eclectic wines. I enjoyed everything that was poured, but I particularly liked the Pinot Gris, Aglianico and Petit Verdot. All three medaled in the Governor’ Cup. The Aglianico was particularly excellent with its berry notes, spice and acidity. The Petit Verdot was also a real standout. This dark, ruby wine showed cherry on the nose and more cherry and berries filed the palate. The structured tannins and long finish make it a memorable wine. I drove up from the south, which really made the winery seem less accessible. In fact, continuing north, it is pretty close to Roanoke. So it is not nearly as remote as I earlier suggested. The lovely property, lineup of wines and inviting venue make it a worth a day trip or a stopping off point, if passing through. I do recommend a visit and I hope that after you stop in, you’ll let me know what you think. The road to Beliveau Estate Winery took me along a beautiful, winding course through the forest and over Catawba Mountain. 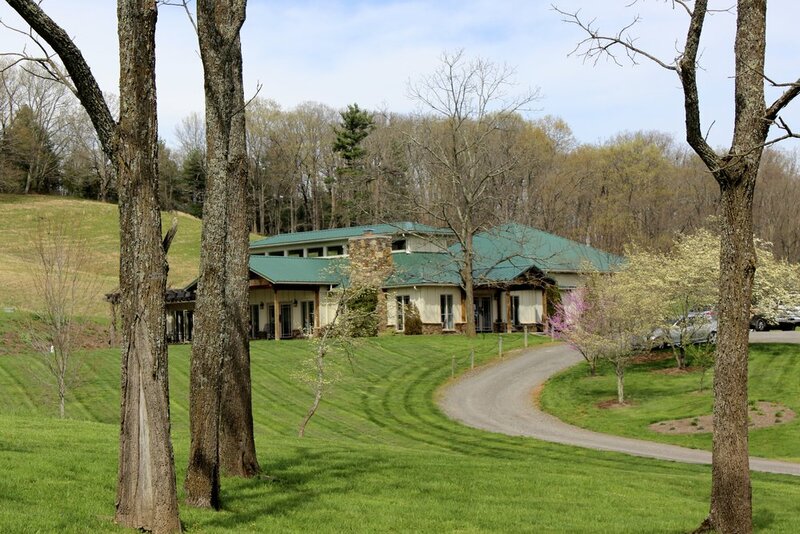 Once I arrived at the tasting room, it was hard to believe that the winery in this stunning mountain setting was only twelve miles from downtown Blacksburg, Virginia. Despite the urban proximity, Beliveau feels more remote than any winery I have visited anywhere in the Commonwealth. Joyce and Yvan Beliveau purchased the property in 2001 as part of a retirement plan. In 2007, the couple opened a bed and breakfast and planted grapes the following year. The first vintage was produced in 2011 and the winery opened a year later. On the estate, there are twelve acres under and additional fruit is sourced locally. They are also importing some Zinfandel from Lodi, but that’s all I will say about that. Beliveau produced 3000 cases of wine this year and there are plans to increase production by 2000 cases next year. A new winery is under construction, but it is unclear when that will come online. The winemaker at Beliveau is Derek Gassler. It is his first winemaking gig and he has no real formal training in the craft, but do not be too quick to judge. Derek is a chemist at Virginia Tech. I have encountered a number of wineries with chemist winemakers and they are uniformly churning out good wine. Beliveau is no exception, but the wine is better than just good. I am a little surprised that I had not previously heard any buzz about this winery. Perhaps it is just a well-kept secret among the locals. It is, after all, pretty far from Virginia’s core wine-producing areas. Nevertheless, all of the wines are good and several are quite remarkable. Among white wines I tasted a nicely balanced Vidal Blanc reserve and very good unoaked Chardonnay. The off-dry Traminette was my hands-down favorite. It was relatively complex with its citrus, apricot and almond notes. It is easily among the best I have sampled in Virginia. I also tasted four reds. The lineup included a very nice Cabernet Franc, the Zinfandel, a Merlot Reserve and a Chambourcin. The Merlot was just out of the park and by far my overall favorite. I was medium bodied, but full of dark fruit. Fig, raisin and clove notes gave way to a very long finish in a wine that can go the distance against any Merlot in the state. Sabrina Stevers conducted my tasting. She has been with the winery for a couple years and does marketing for Beliveau along with her tasting room duties. I must say that her knowledge and professional demeanor represented the winery and the industry very well. The educational elements of Sabrina’s presentation were woven into a conversation about the winery and surrounding area in a way that made the experience informal and fun. Following the tasting, there is ample seating outside on the patio or the lawn to relax with a bottle of wine and take in the amazing mountain views. It is not possible to say too much about the venue. You just need to see it for yourself. If the Virginia Grape had a rating system, Beliveau Estate Winery would get very high marks. I encourage you to visit. This is certainly a winery worthy of our support. The scenery, service and quality of the wine are definite draws. So after you stop in, let me know what you think. Virginia’s largest production winery is, curiously enough, located in the state’s smallest American Viticultural Area (AVA). Rocky Knob AVA is 9000 acres of mountainous terrain that ranges in elevation from 1600 to over 3500 feet. This unlikely wine-growing area contains just two wineries. One of these is Chateau Morrisette, which is located next to the Blue Ridge Parkway between mile markers 171 and 172. Chateau Morrisette opened in the late 1970s and produced its first vintage in 1982 under the Woolwine Winery label. Over the years, production grew to between 60,000 and 70,000 cases annually. This may seem small by west-coast standards, but it does make Chateau Morrisette larger than its nearest competitor by about 20,000 cases. This also allows the winery to export nationally and internationally. In a recent and well-publicized deal, Chateau Morrisette exported about 180 cases of wine to China, which is a pretty significant transaction for a Virginia winery. For such a large producer, Chateau Morrisette has very little acreage under vine. Much further down the mountain, at an elevation closer to 1600 feet, there are thirteen acres devoted to grapes, which represent the original plantings of Niagra, Concord and Muscadine. These grapes are used today primarily to produce wines like Sweet Mountain Laurel, which are some of Chateau Morrisette’s oldest, but still popular, wines. So the vast majority of fruit is sourced within the state. During these times of grape shortage, Chateau Morrisette must have some long-standing connections. Chateau Morrisette has retained Brian Cheeseborough to oversee the winemaking operations. Brian is internationally renown and comes to Virginia from St. Emilion in Bordeaux, where he consistently produced 90+ point wines. Prior to France, Brian made wine in Argentina and California. So he brings a host of experience to his current position. One of the complaints I frequently hear about Chateau Morrisette pertains to the number of sweet wines on the menu. Certainly there are some. Sweet Mountain Laurel, Sweet Mountain Apple and, of course, the Ice-Wine style Frosty Dog are among these. Nevertheless, I didn’t find the sweet-wine claims to be overwhelmingly true. Frequently, fruity wines are mistaken as sweet and this may contribute to the misconception, but most of the wines I tried were either dry or just slightly off-dry. I will say, however, that the winery does produce wines for nearly any palate. There were ten wines featured on the tasting list and the offerings change weekly, so I can only talk about thost few wines. Among them, I had a couple favorites. The Dry Rosé was very crisp with a slight strawberry nose. On the palate, this Chambourcin and Cab Franc blend had big cherry notes with a distinct citric tartness. The Archival I was my top pick among the reds. It’s a blend of all the major Bordeaux grapes except Malbec. It showed big berry notes, rich complexity and a beautifully long finish. It’s an excellent wine by any standard. Everything about Chateau Morrisette is designed to create a first-rate and educational customer experience. The tasting room complex is really a hospitality center with a large courtyard and spacious interior. Across the courtyard from the tasting room you will find a restaurant that offers fine dining and pairs the entrees with the Chateau Morrisette wines. During my own visit, I was lucky enough to spend some time with assistant manager Mallory Hobbs, who graciously answered all of my questions. Andrea, a relatively new wine steward, poured my wine. Despite having only two weeks on the job, she was engaging, informed and brought her own personal touch to the tasting. My experience points to the level of training Chateau Morrisette provides the staff, which really sets the bar pretty high for the rest of the industry. So don’t be put off by size. No visit to Southwestern Virginia’s wine country can possibly be complete without visiting Chateau Morrisette. 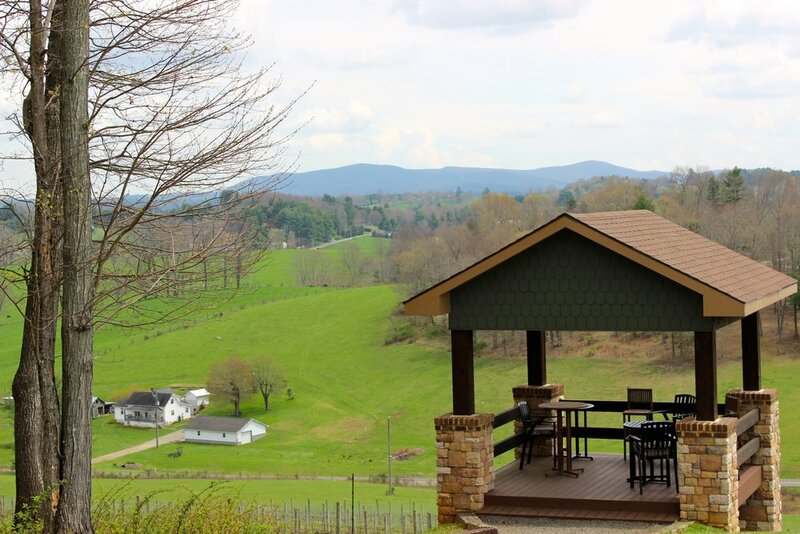 Not far from Rural Retreat, Virginia you’ll find Davis Valley Winery and Vineyard situated on a hilltop with a commanding view of the surrounding Blue Ridge Mountains. It feels more remote than it really is. Both Interstate 81 and the regional Mountain Empire Airport are nearby. Did I mention the view? Stunning! The property that is home to the winery and vineyard was originally dedicated to tobacco and cattle. Mad cow disease threatened cattle markets and the state was actively promoting alternatives to tobacco, so grapes were planted in 2000. Three years later, Davis Valley opened with its first vintage. The vineyards at Davis Valley contain international varietals, but are also planted with hybrids like Norton, Steuben, Carot Noir and others. There are about thirty-five acres under vine. This is a significant amount of acreage for this part of the state. Unfortunately, a recent hard winter claimed about five of those acres, so there is some question as to whether or not the vines will be replanted. On the day of my visit, ten wines were being poured. I’m always interested in trying a new hybrid and I’d never tasted a Steuben wine. I found it to be somewhat similar to Concord. Slightly sweet and with some grape juice qualities. Some of the more traditional wines, however, included a sweet Norton that really went well with chocolate and an exceptionally well-crafted off-dry Chambourcin. Coming soon to Davis Valley is a distillery. The facility must remain separate from the winery, but it will have its own tasting bar. It is my understanding that a number of traditional liquors will be produced along with a line of moonshines. You know you’re in the mountains, when moonshine is available for tasting. So if you’re exploring Virginia wineries, Davis Valley is just a short detour off of the interstate. The range of estate-produced wines coupled with the beautiful mountain view are the draw for this venue. As I pulled into the parking lot at Mt. Vale Vineyards, I was immediately struck by the beauty of the hillside location. The views are stunning, the grounds are perfectly maintained and the winery/tasting room is smartly designed. It seems the perfect spot to pursue a dream. So I spent some time wandering around the grounds and admiring the view and even enjoyed a quick lunch in a hillside gazebo. When I finally wandered into the tasting room, I found the owner, Noel Belcher busy behind the tasting bar. There was a constant stream of guests and they were given the choice of sitting or standing at the bar. So Noel worked the room describing and pouring the wines. I was able to get a few minutes of his time during a lull and he graciously filled me in on the details of his winery. Noel was trained as a design engineer. He went on to start a successful construction company, which he managed until reaching a reasonable retirement age. As he tells the story, he would have been happy to retire in Florida and spend his days fishing, but he asked his wife what she wanted to do next. Trained as a winemaker at U.C. Davis, she naturally wanted to open a winery and practice her craft. In 2008 they planted three acres of grapes on their hillside property near Galax, Virginia. Three years later, she produced the first wine for the newly opened Mt. Vale Vineyards. A short time later, she became ill and subsequently passed away. Noel was left with a winery and his wife’s dream. In her memory and in the spirit of the project, he pressed on. Noel knew nothing about winemaking. He brought in Mary Simmons from Surry Community College in nearby Dobson, North Carolina. One hears much about Surry in that part of the state. The Community College has an extensive wine-related curriculum and Mary was part of the staff. She spent a couple years making the Mt. Vale wines while training Noel to take the helm. Today, Noel is the sole winemaker at Mt. Vale. He uses hybrids from his vineyard and sources vinifera from the nearby Yadkin Valley to turn out about 1000 cases annually. Noel has given some thought to increasing production to as much as 1800 cases, but it is not clear that it will happen in the near term. For now, he is making eight different wines and concentrating on quality. I sampled a few of the offerings and I can tell you that Mary Simmons successfully imparted her knowledge. The wines are all well made and there is something for nearly every palate. I tasted a very good Bordeaux blend and another interesting red blend of Cabernet Franc, Marquette and Frontenac. My top picks of the tasting were the single-varietal Cabernet Sauvignon and a Burgundian-style Chardonnay. The Cab Sauv was big and deep red, filled with cherry and berries. The Chardonnay was excellent and a perfectly balanced wine with apple, honey and vanilla notes. It was a fabulous wine and my overall favorite. Mt. Vale Vineyards is just down the road from Galax on the eastern slope of the Blue Ridge. It is a regional highlight in an area that draws a large volume of tourists during the warmer months. If you are down in that part of Southwestern Virginia, I recommend making the effort to stop in, admire the view and taste the wines. It is a must-see winery and after you visit, I would love to hear what you think. The idea of a downtown tasting room is not unusual. You can find examples in Staunton and Charlottesville. So the fact that the tasting room for Rural Retreat Winery and Vineyard is in located in the town of Rural Retreat is not surprising. By most measures it’s a small winery. In order to make the operation profitable, the winery also operates a deli in the same space. So a sandwich and glass of wine can be had in this small, Southwest Virginia town. Rural Retreat was originally Dye Vineyard and that is explained on the sign that sits across the street from the tasting room. The original vineyard was leased for a time, but Scott and Linda Mecimore recently planted eighteen acres just outside town at an elevation of about 2500 feet and they have another four in Pulaski, so the Dye vines are no longer needed. As I said, this is a pretty small operation. The winery currently produces between 500 and 700 cases per year, but they are making sixteen different wines. Despite the small production numbers, there seems to be quite a wine library, because nothing being poured is younger than 2010. Even the white wines had a bit of age. Linda Mecimore was in the tasting room when I arrived and she poured each of the offerings. There were a pair of Cabernet Francs from 2006 and 2008. Most tasting rooms are not pouring anything with that much age. Aside from the Cab Francs, which I found quite interesting, there were a couple couple wines of note. I quite liked the Riesling, with its floral bouquet and distinct peach notes. The semi-sweet Chambourcin Rosé was another. It had bright strawberry notes and impressed me as a wine worthy of summer sipping on the patio. If you’re driving through Southwestern Virginia and exploring the Blue Ridge wine region. Rural Retreat is just a few minutes from I 85. Stop in for a sandwich and a glass of wine. If you ask David Stanley how his family got into the business of making wine, he’ll tell you “it’s because his father is a plumber.” That’s his standard line, before he goes on to explain that his father did the pipefitting for Chateau Morissette. It was from this relationship, that Nelson Stanley got the idea to grow grapes on his property in Patrick County Virginia. Of course, nothing is ever quite as simple as that. I guess you could say, there were a few obstacles. First of all, the Stanley family knew nothing about growing grapes. They sort of learned along the way. They took seminars and classes at Surry Community College. They did a lot of reading. They also got some guidance from Chateau Morissette, who was purchasing the bulk of their fruit. It didn’t hurt that there was a buyer for their produce, so that part all came together. Then they decided to take the next step and make wine. If the Stanley family knew nothing about growing grapes, they knew even less about making wine. Nelson and David experimented in their basement. Then there was the episode where efforts to save a batch of wine left the entire Stanley home smelling like rotten eggs. Elsie banished them to one of the out buildings and they decided they needed help. But where does one turn in rural Patrick County, an area that has virtually no wine industry? As luck would have it, Nelson had a neighbor, who trained as a winemaker in Adelaide, Australia. This just happens, by the way, to be one of the most prestigious programs in the world. After graduation, Jocelyn Kuzelka made wine in Australia and New Zealand before moving back to her farm in Patrick County. She was doing some consulting, but was trying to figure out how to stay on her farm and make a serious living in the wine industry from a base that is far removed from the main winemaking regions. Problem solved. She became the head winemaker for the newly founded Stanburn Winery. Jocelyn still consults, but her regular gig is just down the road. David and Nelson are quick to point out that Jocelyn is “the" winemaker. The first year, the Stanley family diverted a small portion of their fruit to the new commercial venture. After the wine was bottled, they stacked a total of 73 cases in their storeroom and wondered, “how on earth would they ever get rid of that much wine?” Of course, that’s a ridiculously small amount of wine and it flew off the shelves. So they now sell about half of their fruit and, with the rest, Jocelyn is making about 1500 cases annually. There are even plans to increase production to between 2000 and 3000 cases. Not only have they been amping up production, but the quality of the wine is exceptional. I first tasted a couple of the Stanburn wines at the Virginia Wine Expo in Richmond. I specifically remember the Barbera. That’s right, I said Barbera. I have tried a couple other local examples and I have not been particularly impressed. The Stanburn Barbera was just out of the park. At that moment, I began making plans for a trip to Patrick County. An outing, I might add, that was completely worth the effort to get there. I won’t go into detail or offer notes on all the Stanburn wines. I will say that they are making about a dozen wines using both vinifera and hybrids. I was particularly impressed with the Vidal Blanc, Cabernet Franc and the Barbera (of course), but there really is not a runt in the litter. For a small family winery in a part of the state that is not known for wine production, Stanburn is producing wines that will compete with Virginia’s top-tier producers. The Stanleys discussed some of their plans for capital improvements. The tasting bar is in one room of the main winery building. It is well organized and functional, but small. There are plans to remodel the old farmhouse and convert that into a tasting and event space. Creating an outdoor concert space seems to also be in the cards. As is the case with most development, it will take place over time. In the end, however, I’m sure they will create an atmosphere that matches the quality of their wine. If you are interested in purchasing bottles of Stanburn wine, you may be able to catch them at one of the Virginia wine festivals. Otherwise, they market through direct sales out of the tasting room. This seems like a good excuse for a road trip. 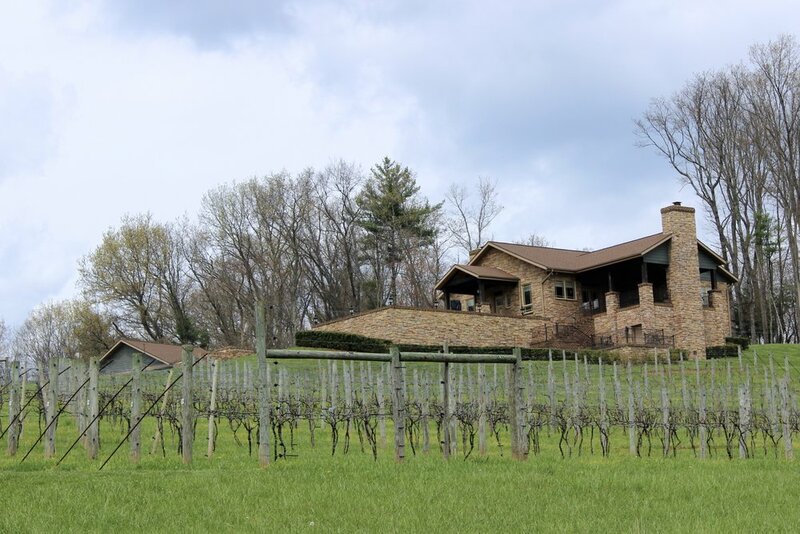 If you are seriously exploring Virginia wineries or if you are just looking for bottles of quality Virginia wine, Stanburn should be on your radar. They have the Virginia Grape’s prestigious seal of approval, so get down there and see what they are all about. When you do, please let me know what you think. There are only two wineries in the Rocky Knob American Viticultural Area (AVA). Villa Appalaccia is one of them and sits at an elevation of 3500 feet just a couple hundred yards from Blue Ridge Parkway. You might rightly wonder how a serious winery can be located this high in the mountains. Well, you’d be surprised. This particular venue is producing some of he most interesting wines in the state. Villa Appalaccia started planting fruit in 1989 just down the mountain from the tasting room-winery complex. They grow a handful of French grapes, but specialize in northern and southern Italian varietals. There are twelve acres in all and the fruit seems to thrive in the shale soil on the slope of the Blue Ridge. It's a husband-wife team that operates the winery and tasting room. During both of my visits, one or both of them have been staffing the tasting bar. Stephen and Susanne are involved in all aspects of the operation, but Susanne is really the winemaker. Her training as a microbiologist helped provide a window into the science of winemaking, but there’s a certain degree of art involved and she seems to have embraced that aspect as well. The wines are quite extraordinary. I tasted ten wines during my most recent visit and I simply can’t say enough good things about them. The whites included an excellent Pinot Grigio, a crisp and well structured Vermentino, a white Primitivo with subtle floral and strawberry notes, as well as an off-dry Moscato and Pinot Grigio blend. Among the reds, there was the Villa Appalaccia version of a Super Tuscan that was a Cabernet Franc/Sangiovese blend, an amazing Cab Franc, a well-crafted Aglianico and they are the only winegrowers in the United States to produce a Corvina (the varietal used for Amarone and Valpolicella). There is also a Primativo, which was not on the tasting list, so I took a bottle home. It was tough to narrow the field and concentrate on a couple favorites, but I am a huge proponent of the Vermentino and the Corvina. The Vernentino is a clear and crisp, but well structured wine with subtle melon notes. The Corvina had a wonderful nose of berries. The same bright fruit was evident on the palate and the finish was to die for. It is really an exciting wine. The 2400 cases produced by Villa Appalaccia each year are sold exclusively out of the tasting room, so a visit is the only way to sample or purchase the wines. If the quality of the wines is not enough reason to stop in, there are a other incentives. The tasting experience is totally first rate. As the wines were poured, in addition to the obligatory description of the wine, there was also background on the varietal. I found it to be very educational, but also very relaxed. Finally, I should point out that the mountain views along this section of the Blue Ridge Parkway are among the best in the state. You really can’t find many spots more beautiful to sit and enjoy a glass of Virginia wine and you’ll be hard pressed to find better wine in Southwestern Virginia. After your visit, let me know what you think. The one hundred acres that are known as West Wind Farm Vineyard were settled in the mid-nineteenth century as Mount Zephyr before changing hands in 1914. Paul and Brenda Hric returned to Max Meadows, Virginia in 2003 to the property that had been in Brenda’s family for four generations. They had owned and operated two successful businesses prior to coming home—the second of which was a greenhouse and nursery. So they brought the organizational skills and agricultural knowledge to make a winery work in a part of the state where winemaking is not a typical pursuit. With the exception of the tasting room and vineyards, the property probably looks much as it did one hundred years ago. It is an open expanse of land comprised of rolling hills. Woodland surrounds the property and the original nineteenth-century farmhouse still occupies the high ground. It is a venue where one could easily while away an entire day enjoying a picnic and the local wine. There was a nice crowd gathered when I arrived. The Hrics had just concluded a cooking class, which is just one of many activities offered at the tasting room. The Summer Saturdays Concert Series is another of the popular draws, but a flurry of visitors will be encountered on nearly any day. Its location near the intersection of Interstates 77 and 81 makes the winery easily accessible and insures a steady stream of local regulars as well as people just passing through. The Hrics planted five acres of vines in 2003 and concentrated on cooler-climate varietals that might thrive at the higher local elevations. A few other warmer-climate vinifera are sourced from elsewhere in Virginia. The grapes are used to produce about a dozen different wines and roughly 1600 cases of wine annually. Every effort has been made to insure quality and I can tell you that all the wines I tasted exceeded even my highest expectations. West Wind is producing top-tier Virginia wine. Among the whites, I was particularly excited by the Gewürztraminer and the Riesling. Both were done in a dry style. The Gewürz had nice floral notes followed by grapefruit and a bit of spice. The Riesling had slightly more residual sugar, but it was perfectly balanced with pear and tropical fruit on the palate. My top red was the Cabernet Sauvignon. It is made from sourced fruit, but expertly crafted and full of dark fruit, anise and mocha and a wonderful finish. It is a potential award winner and a wine that needs a few more years in the bottle. I walked away thinking that this was a great find. Not that it is in any way hidden, but I did not expect to encounter this quality of wine tucked away in a corner of the Blue Ridge. This is a winery that is certainly ranks among the best in the Commonwealth. Sadly, it is on the market. We can only hope that any potential buyer will continue to build on the quality and reputation established by the Hrics. This is a winery that should be on everyones watch list and a must-visit venue. Make an effort to stop in and, when you do, let me know what you think. As I was driving in I noted that more grapes had been planted. Of the 17.5 acres on the main winery campus, nearly 13 are under vine. “We are actively filling every possible inch on this property with vines,” Obiso told me, and “we also have long-term leases for grapes across Virginia.” Annual production in cases is somewhere between 4000 and 5000. “[White Barrel has] many plans for increasing production and [has] an entirely new product line coming out early next year,” Obiso confided. For now, however, the new product line is a secret. The tasting room was largely they way I remembered, but with a much bigger crowd. Maybe the rebranding was paying off, but there was a downside. Obiso described weekends in the tasting room as “quite busy or even a bit insane.” That is an accurate assessment. The staff was working at full speed to keep up with the crush of patrons. Customers were queuing up for a turn at the tasting bar, others were seated while awaiting tapas orders from the kitchen and a sizable number were hunkered down drinking wine. took me about thirty minutes to finally get a space at the bar, where tasting options include sweet, dry or both. I opted for dry. I was then assigned to a section of the bar with other patrons who had selected the dry flight. The tasting proceeded efficiently with a brief description of each wine. I will say that it was all a bit rushed and there was almost no time to ask questions. There were just too many people waiting to taste. Getting back to the wine, I will say that the half-dozen that I tasted were well crafted. I was particularly impressed by the single-varietal Cabernet Sauvignon. It had a great nose and on the palate it was full of black currant, leather and firm tannins with a medium finish. So despite the crowds, there are some very compelling reasons to visit White Barrel Winery. There are interesting things happening with the wine and, of course, the release of the secret 2017 product line might motivate you to make the drive. I do recommend that we support this winery as Rik Obiso works through the staffing issues. After you stop in, please give me an update. I am always interested in hearing your thoughts.